I can’t begin to tell you how many times I’ve found a barber that I liked, got attached to them, just to have them pick up and move to a different location, never to be seen again. I’ve had to basically resort to stalking to find them again! Kidding, but it is incredibly frustrating because when you have to try out a new barber, it’s a crap shoot. When you find a barber that works for you, you build chemistry, and they know how you like your hair done, and you know what you’re walking out with each time. It’s a win/win. But how do you find a great barber? It’s a tricky process, but we’re going to walk you through it! The traditional barbershop is dissolving, unfortunately. The small, reliable barbershops ran by the swanky chaps who have 40 years of experience are few and far between there days. However, they aren’t dead; they are just in hiding. Check around with friends or family: If you see a friend who is always rocking a clean haircut, hit him up! Ask him where he goes, who he uses, and how long they have been there. Chances are he doesn’t just happen to get perfect haircuts every time regardless of who is cutting it. He has likely found a barber who he meshes with, and he goes to them every time. Read online reviews: The internet is an endless capacity of good information. The internet is so interconnected that each time someone gets a good or bad haircut, they are likely to report it online. If you have someone in mind, look them up, check them out, and see how well everyone else likes them and how consistent they are. Trial and error: Unfortunately, if the internet fails you, you may just have to venture out on your own. Try to narrow your search down to places that seem to be popular. And I don’t mean commercialized places where loads of people come to get cheap haircuts. I mean places where other swanky males hangout and walkout looking clean and well groomed. These are the places you want to try. Just make sure you choose wisely; these places usually only have a couple of barbers who work everyday. Social media: When in doubt, post a Facebook status! Even if you move to a new area, there are certainly groups around who discuss these sorts of things. Just post a quick status asking people around you who they use, who they recommend, and continue your research from there. Don’t be afraid to ask the guys around the office or around the town. If you’re able to strike up a conversation with a good-looking fella, don’t be afraid to ask him where he gets his hair done. It’s not weird, it’s a compliment, and it will almost certainly be taken as such. Try more urbanized areas. There are plenty of small barber shops around any town that utilize the iconic red and white swirls. These are almost always filled with experienced barbers who have been in the game for a long time. These types of places are always worth a look. Experience: Look for someone who have been in the game for several years. Use the internet to search for their reviews. It’s probably not wise to choose someone who just passed their certification in the past year or even few years. Choose someone who has several years of experience cutting your type of hair. Camaraderie: Choose someone that you get along with. Choose someone who genuinely takes pride in your looks. A good barber cares about making you look good. Find one who does and stick with them. Location: Pick a location around you house that attracts the guys in town. This is a great way for you to network, socialize, and it’s more economical. Confidence: Is the barber confident when you tell him what you want done? Does he seem unsure of what you’re asking? These are all things to look for when you’re picking out a barber. He needs to convey confidence. He needs to know the terms you use. He needs to agree to what you’re asking him to do before he begins. Cleanliness: How clean is the shop? Health concerns aren’t as big in barbershops as they are, in say, a restaurant, but it still matters. You can still get cut, clipped, etc. and you don’t want that to happen with a dirty pair of scissors. Questions: Does he ask questions? If he does, then he likely cares how you want to look, not how he thinks you should look. How about your sideburns? Do you want the back rounded or squared? Would you like the have the top razored? 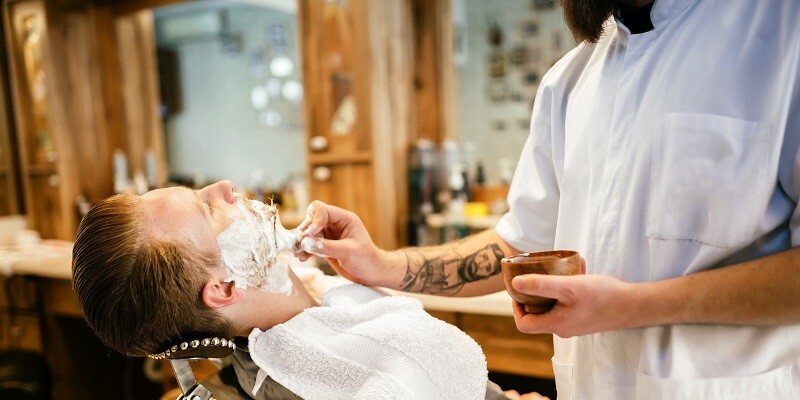 Do you want to be cleaned up with a straight razor? These are all important questions, and he should be asking them. Why is finding a good barber important? When it comes to grooming, consistency is key. That being said, finding a barber who consistently does a smashing job of cutting your hair is absolutely crucial. Take my hair for instance, my hair grows very awkwardly. if it is cut too short, it doesn’t look right, if it is cut too long, it doesn’t look right. It has taken me years and years of getting attached to barbers at commercialized dwellings just to have them take off, to finally look for someone who has been at the same barbershop for 20+ years. When I found the right person, it did wonders for my confidence. No longer did I have to take a gamble on a barber the day before a big event. I walk in every time knowing exactly what I will look like when I walk out. There is just comfort in knowing that when I absolutely need a good haircut, I can go to my barber, he will be there, and he will do a great job. My barber also cares about how I look. This is definitely rare in terms of commercialized barber shops. I tell my barber almost everything. He knows who I am dating, where I go, how I prefer to dress. he uses all of this information to optimize the best haircut for me. He doesn’t try to sell me on extras; he just does his job, and he’s good at it. There is also a social aspect to it. Barbershops are a classic hangout spot for the local alpha-males in town. It’s nice going into the shop once a week or once every two weeks and see they guys. We swap stories, talk stocks and sports. It’s a great way to build camaraderie. It’s also a great way to network. It’s similar to going to the golf course, but for those who enjoy indoors and air conditioning. Lastly, barbers are like bartenders. They have seen and heard it all, they offer great advice, and they tend to be good, nice, happy guys. It’s never a bad idea to hang out and consult with your local barber. Especially if he is making you look good in the meantime. To put it bluntly, don’t be one of the drones that settles for any old haircut by any barber. Find out what works for you. I mean really try to find the best look for you, then find a barber who can give that to you each and every time you go in there. It’s important for us guys to take pride in our look. The barber can help supplement that for us. Also, for me anyways, having a good barber on hand is an incredibly useful tool. Being able to go to him during the week to get a solid haircut has helped increase my overall confidence. With pretty good confidence I can go to the barber every time and know that I will not likely walk out looking like an idiot. Lastly, they may be hard to find, but they are worth the look. Take pride in your look and your style. Stay sharp for your significant other or future significant other. Thanks for the read, gentleman.